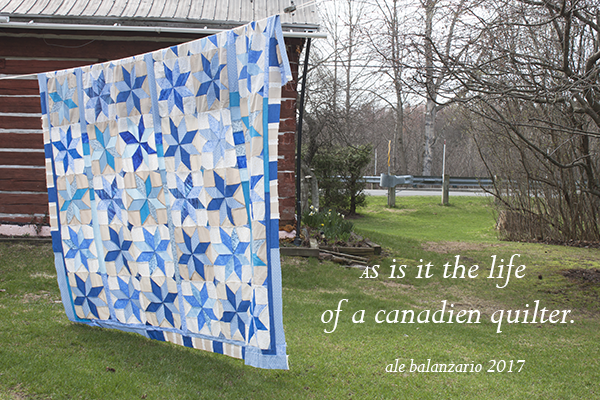 A quilter’s life in Canada. Morning is a bit clouded, so I want to try to get some photos of my last quilt top, as I grab the top with one hand, I try to get the camera with the other, as I walk to the door, I ask my husband ‘how is weather outside’, he is busy at that moment on his computer but he answered to me, ‘normal’. When you are Canadian and you have live here all your life, no snow outside means weather is ok. It’s not the same if you haven’t live here all your life, for me some mornings are fresh or even cool even if there is no any snow at all. No Skunk, no foxes or any other kind of big creature. Living in the country in Canada means you need to share this beautiful land with all kind of creatures, and I don’t have any problem with it, but I just don’t want to meet a skunk on my way outside. That would not be good for me or for my new quilt top. People around here talk often about who has been sprayed the last, and some people like to tell me skunks are not a problem, just grab them by the tail and that’s it. I won’t do it. So I always check if there is no skunk in the yard before I go outside. When you live in the country, it’s a quiet life. 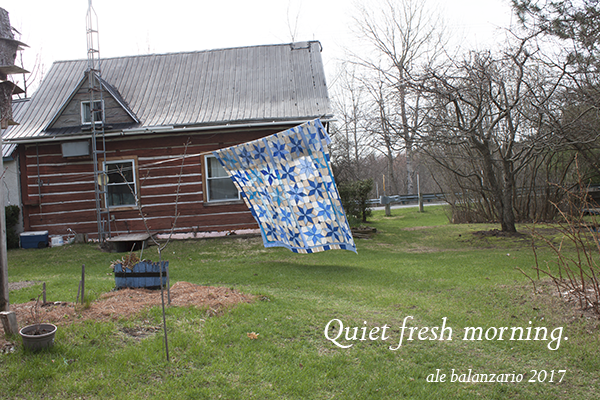 As I live in the country, most of my days are quiet and I have long hours to work on my quilts. Weather is a factor to think about when you live here, long cold with poor day light winters and short with bright light summers, that means I need to get used to quilt from one condition to the other point. Cold winter days are not a problem. At least for a quilter, I just need to start a fire in the wood stove and house will be cozy and warm, perfect to work on a quilt. Hot and high humidity summer days. That can be a problem when you want to spend a few hours every day working on a quilt, can you try to quilt by hand when it’s hot outside?, not easy to do at all. I need to start AC to be able to work on my quilts. Where do I get all those beautiful fabrics to make a quilt. Living in the country, that means every fabric quilt store is far from home. Vallefield, 30 kms from home, there is one small store and they just have a few fabrics for quilts. And of course, there’s here a big store where I can get the batting fabric, quilting thread and some other supplies for my quilts. Montreal, 50 kms from home, I just found one fabric store which has a few good fabrics perfect for quilts. I just need to go there and get all the fabrics I need before winter hits here again. Ontario, 90 kms from home, I found there a bigger store where I can find more fabrics for my quilts, once again, I just need to get there during summer and fall. I haven’t tried to get my fabrics online, if you know about one good online fabric store, let me know about it, I would like to give it a try. 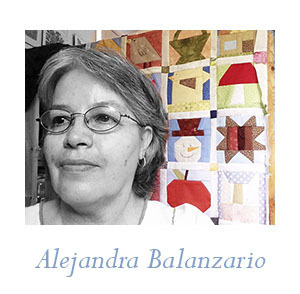 A quilter who also cooks. As we live in the country, is not easy to find a place where I could buy food ready to have, there is a few restaurants around here and a couple of groceries stores, when you have been here for two months, you have visited them all, so you get a little bit tired of same food all the time. So I cook and prepare our meals every day. The good thing about this, my husband does dishes every time, that helps me a lot and gives me more time for my quilts. Well, to tell you the true, I used to be a full time quilter, not anymore, I like to make a stop, and try something different, I also enjoy to go outside to go for a walk or to go for a bicycle ride, or to visit a new place. To be a full time quilter is nice, but to have some free time to do something else is also nice, so I can go back to work on my quilt again. This top will be quilter soon, I’m just looking for the right fabric for the back, as soon as I start working on the hand quilting I will let you know, so I will be sharing with you how it turns into a quilt. Now it’s your turn, I would love to know where are you from, I’m sure you live also in a nice place. Are you working on a quilt, if you have a blog and you blog about your quilts, leave a comment, I would love to pay you a visit.